00:05:00 Makes 2 cups or 2 servings, 1 cup (250 mL) each. Makes 2 cups or 2 servings, 1 cup (250 mL) each. Put your feet up and pretend you're beach-side with this refreshing raspberry and grapefruit blend. Mix ingredients until drink mix is dissolved. For a tarter flavour, substitute grapefruit juice for 1/2 cup of the water. Prepare as directed, mixing 1/4 cup vodka with the remaining ingredients. 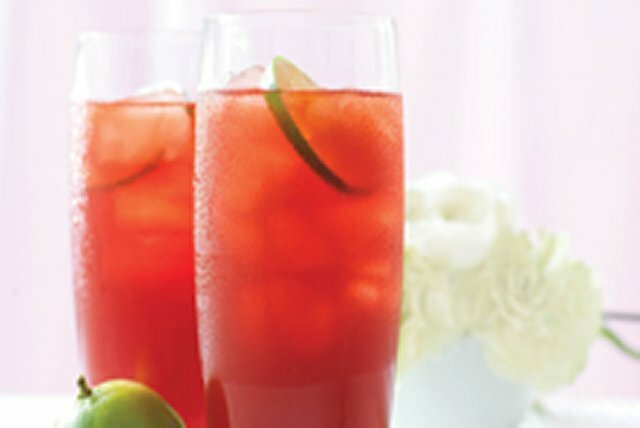 Prepare using Crystal Light Singles Cherry Pomegranate Low Calorie Drink Mix. Garnish filled glasses with lime slices. Quench your thirst with this refreshing drink. As a bonus, it's a source of vitamin C thanks to the grapefruit juice. Serving Size Makes 2 cups or 2 servings, 1 cup (250 mL) each.